Though Jeon Yong-woon is still not used to the local food, the Korean businessman has decided to stay in Southwest China for at least three months as he learns the craft of woodcarving. 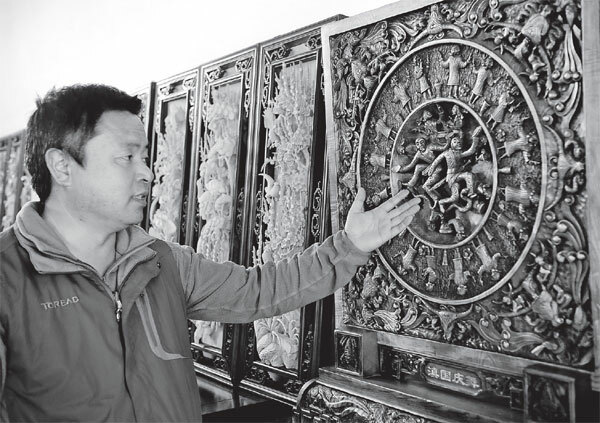 Two weeks ago, Jeon, 59, came to Jianchuan county in Yunnan province to learn from Duan Sixing, a master of Jianchuan woodcarving - a national-level intangible cultural heritage art form. "Masters of Jianchuan carving can carve a common plank with various layers of hollowed-out figures, making carvings of flowers and birds seem alive," Jeon said. Jeon first became interested in woodcarving in 2015 when he and his Chinese wife Wu Zhuorui went to her hometown Kunming, the provincial capital, and bought some carvings. "The carvings brought the wood back to life," Jeon said. Back in Seoul, he registered for a carving class. It took years for him to progress from being a layman to a wood carver capable of creating reliefs independently. "I told him one day that Jianchuan woodcarving is famous in China," Wu said. "But I didn't think that he would go there to become a student for real." Jeon researched Jianchuan woodcarving online and was amazed by Duan Sixing's works. "The carvings are vivid, delicate and more beautiful than I could have ever imagined," he said. Despite his wife's concerns about the difference in language and customs, Jeon was determined to become a student of Duan. Jianchuan county in the Dali Bai autonomous prefecture is home to various ethnic groups, with the majority of them Bai people. Historical records show that the local Bai people developed the unique craftsmanship, after absorbing techniques from the Han and other ethnic groups. The preserved intangible cultural heritage reflects the Bai people's tradition and culture, ranging from household decorations to architectural details, such as gates and window frameworks, experts said. The county has plenty of wood carvers who make exquisite carvings of all kinds of figures, flowers, birds and mountains, as well as dragons and phoenix which symbolize luck in China. The skill has been passed down for thousands of years. High-quality rosewood and alder birch are the main raw materials. "With the help of the local authority, I visited Duan and expressed my willingness to learn from him," Jeon said. Donning an apron and chisel, Jeon is currently carving a piece of wood about 30 centimeters square. "A dozen chisels of different sizes are used according to the complexity of the patterns," Jeon said. "Beginners usually need about a week for a small piece like this, but it only takes Duan two days." Duan is happy with his foreign student who has traveled thousands of miles. He is teaching him hollowed-out high reliefs, a technique unique to Jianchuan woodcarving. "Although Jianchuan carving is different from Korean carving in tools and techniques, as long as Jeon is willing to learn, I will teach him," Duan said. Jeon plans to introduce Duan to more Koreans and would like to invite the master to his country. "We can't be complacent or conservative. International exchanges are mutually beneficial, which can help Jianchuan carving," Duan said. The traditional craftsmanship has become a pillar sector of the local economy. At a woodcarving-themed town in the county, roughly 21,000 local people are involved in the industry. They work at 116 woodcarving enterprises, 20 architecture firms and 1,500 small private businesses.